They are special, and most are mothers, but there is something more to these women. It takes a very special person to care for someone else’s children as if they are your own, and that is what the Special Mothers do for our children. These very special women work alternating days, caring for our children. They are the ones who celebrate successes, kiss boo-boos, pray with our children, discipline our children, and hold them when painful memories are too much to handle. They stand in the gap between the biological families who aren’t able to care for these children and an uncertain future. Visitors to our home love Mama Noemi immediately. She’s welcoming to visitors, loving to our children, and dedicated to her staff. Her laugh is contagious and she loves life. If music is playing, Mama Noemi is dancing. She is the embodiment of what we stand for—steadfast, dependable, loving, and most of all, fun. For more than 12 years, Mama Noemi has faithfully worked at Dorie’s Promise, serving currently as the Supervisor of our girls’ house. She oversees all of the daily tasks of that house, the general well-being of our girls, and the other Special Mothers who work with our girls. 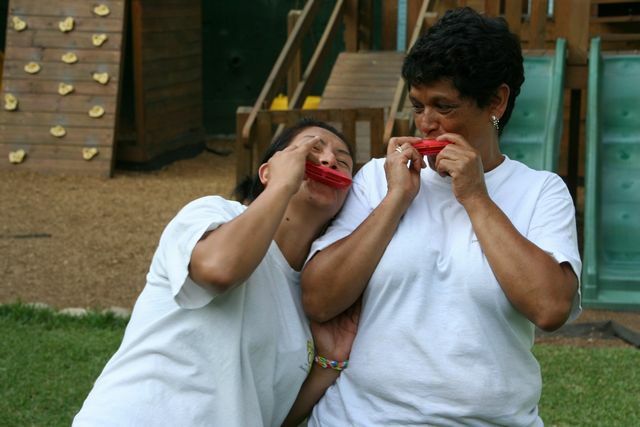 Joining our staff in 2005, she has experienced our growth as an organization and helped shape our homes. Mama Noemi worked at Dorie’s Promise while international adoptions were open and continued with us during our transition to orphan care. As she looks back, she describes her role during the international adoption period as that of an intermediary, caring for children until they could be united with an adoptive family. After the close of international adoptions, her work changed. Many of our children will live with us for most of their childhood. Mama Noemi enjoys the opportunity to create long-term relationships with our children, built on trust, respect, and love. Being able to watch them grow, learn, and mature is a unique opportunity not available during her early years with us. Those who work closely with Mama Noemi understand her love for our children and commitment to their well-being. Her dream is for all of our girls to become strong young women who have the opportunity to be successful adults. Just like she loves her own children and grandchildren, she cares deeply for each of our children. Each morning after the children leave for school she leads our Special Mothers in prayer for our children, interceding for their needs and praying for our home. Every day she comes to work with a positive attitude, ready to give her best to each of our girls. The way Mama Noemi leads her staff and interacts with our children demonstrates a greater purpose. She recently shared, “for me, working at Dorie’s Promise is a mission, not a job.” We experience her focus and dedication every day. Thank you, Mama Noemi for blessing our home with your love and dedication!